Do you have a quilt that's too large to handle comfortably on your domestic machine? 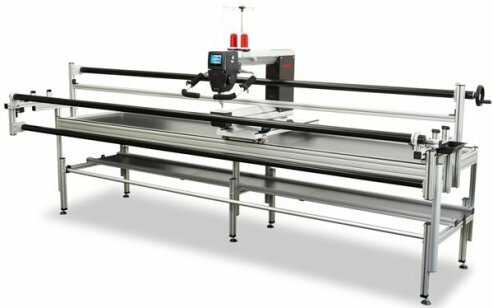 Are you considering purchasing a longarm quilting machine, but would like to try one before you buy your own? Come to our Longmont location and rent some time on our BERNINA Q24 in our upstairs classroom. This amazing machine features a completely illuminated 24" throat, a 10 foot frame, two built-in stitch regulators, fully adjustable programmable handles, built in color touch screen, digital top tension, a hand wheel and bobbin winder in the front, and easy threading from the front of the machine. You will find this machine friendly to operate and maintain, making finishing your quilts a breeze! This is the perfect way for you to experience all the details that make the BERNINA Q24 the best choice for your longarm quilting machine. Our rental Q20 is in a sit-down, portable table for those who prefer not to stand and quilt, and who are more comfortable moving the fabric rather than the machine head. The Q24 and Q20 are available for rent anytime we do not have another class scheduled in our upstairs classroom. Please check the Longmont Calendar page and call our Longmont store at 303-485-6681 for availability. Hourly rental rate is $15, in one-hour increments. Longmont Calendar page and look for the BERNINA Q24 Basics class for dates, cost and details. See the Q24 Rental Agreement for terms.